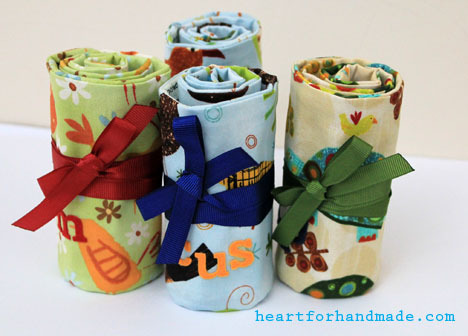 I came across CAS-ual Fridays Challenge (CFC) blog through another blog that I read online. The blog focuses on a weekly challenge for clean and simple card, uncluttered with lots of open white space and one clear focal point. Can’t remember which blog I read it from but I got interested because of the opportunity for readers to play along. There’s a new theme every week and challengers will interpret them the way they want it, clean and simple. I being a newbie would love to take part on this call. There are a ‘lot’ of participants every week and getting the top spot may take a little bit of luck. I think though that even if I don’t win, the fact that I joined in to improve myself is already gratifying. Don’t you love to do something that makes you feel happy after doing them? 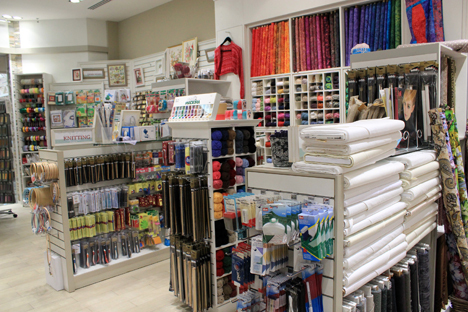 I’m often asked how I am able to do crafts or sewing with all the busy schedule we have every day. Well I say, that’s something that I really love doing and if you want to do something that you enjoy, you’ll find time to do it even if you too occupied for the day. So on to the challenge, CFC67: Create a Clean and Simple project that features banners or flags I used a scallop punch, fold the punched paper into half then I get a scalloped shape banner. I just snip off the extra ridge of folded scallop to have a cleaner cut of the banner. Also used an inch circle punch for the half circle shape, then used twine to hang them. It’s very straight forward approach to the challenge. There are some little bits of embellishment I put on top of my banners. Sentiment stamp from Hero Arts. I have a tin box where I keep random piece of paper, die cuts and other whatnot from previous projects that are kept- to-use- later. Until the next clean and simple card challenge. Hero Arts is running a monthly card challenge and this is my first time joining in. I only have limited stamps and I’m dreaming of having more to play with. Since I don’t have much of them I’m trying to make the most of what I have on hand. This alone is a challenge don’t you think? 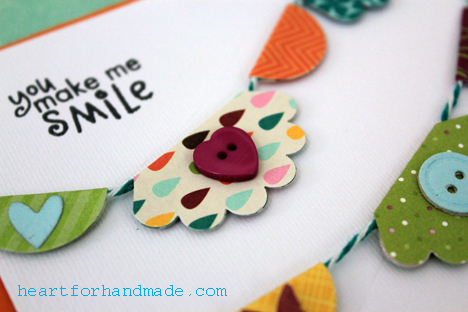 One of the challenge option for August is to make a card using one of the three Sketch Challenge they provide. It can be of any theme but I went for a birthday card. I’m using the layout on the left. And my card interpretation, I used Hero Arts stamp sentiment. 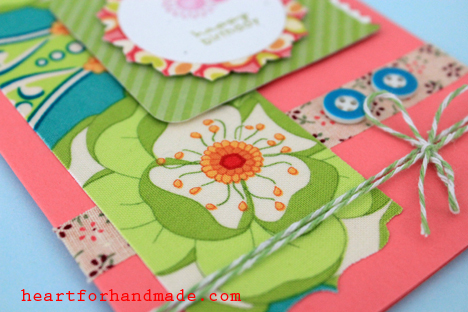 Paper from Echo Park (they have so fun and colorful paper collections), ribbon and crochet ribbon from my stash. 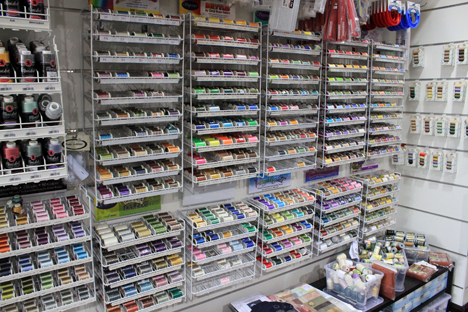 I’m joining again in Embellishment Blog, Pinwheel Color Trends Challenge. I used papers from Stampin Up! 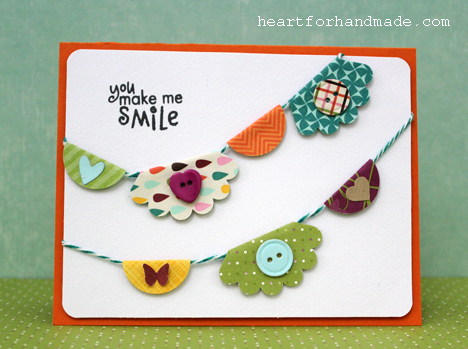 and sentiment stamp from Hero Arts. 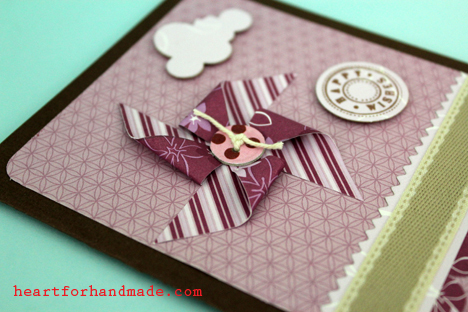 I die cut the cloud and zigzag line next to the ribbon from Papertreyink. 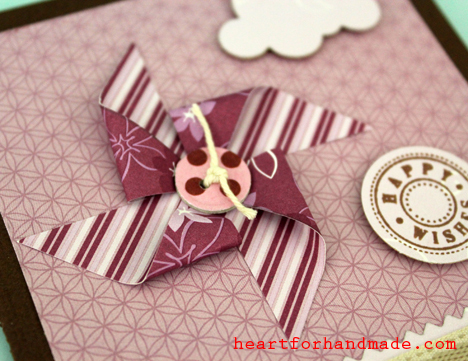 My pinwheel’s embellishment button came from my previous stash when I played along the buttons challenge. I missed a number of card challenges during my short holiday break but now that the routine starts to go back to normal, I’m beginning to do some creative works again. 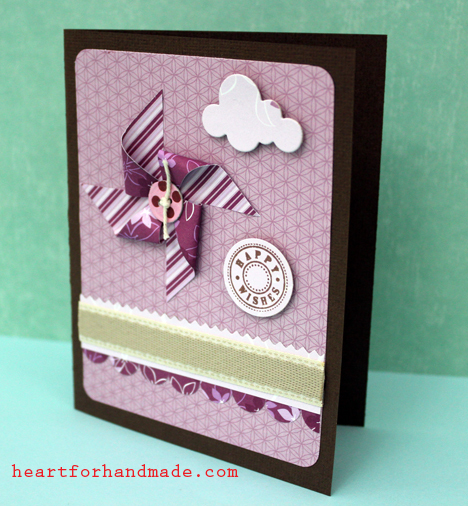 This week Im playing along Papertreyink’s Make it Monday # 79, Fabric die cuts. 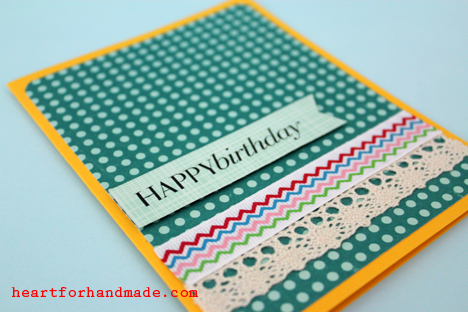 The challenge is to use fabric die cut into your card. Here I used a fabric by Sandi Henderson Meadowsweet collection. 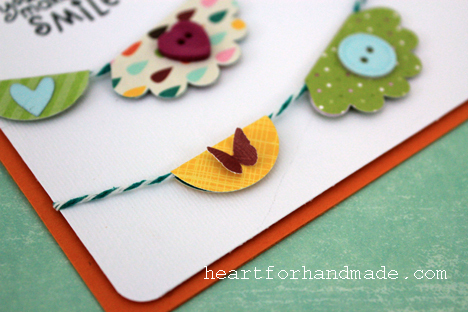 This is the vibrant green strip on the left, die cut that part using Papertreyink half & half die. 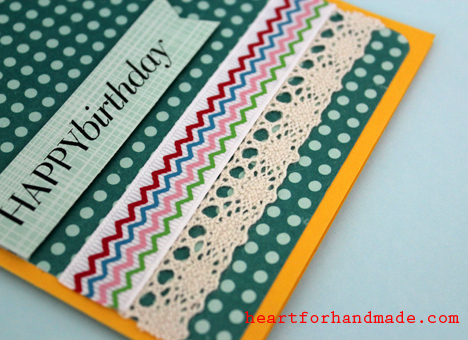 The Happy birthday sentiment & stamp is also from Papertrey Tags-its # 1 stamp set. The circle and red background (this red background is a fabric die cut as well) is also from Papertreyink die cuts + the zigzag detail on the end. 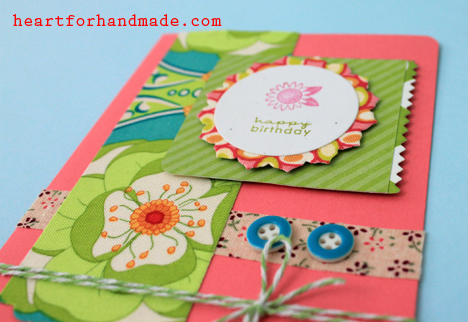 The green paper background is from Echo Park Dots & Stripes. For the other details, the running strip in the bottom is a fabric tape I got from my stash along with the button & twine. I love the final outcome of this challenge. 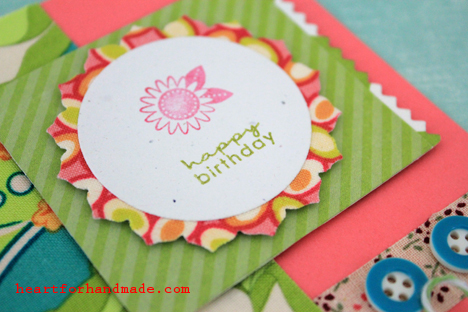 The colors are vibrant,just perfect for my friend’s jolly personality who’s celebrating her birthday very soon. On to the card photos.. 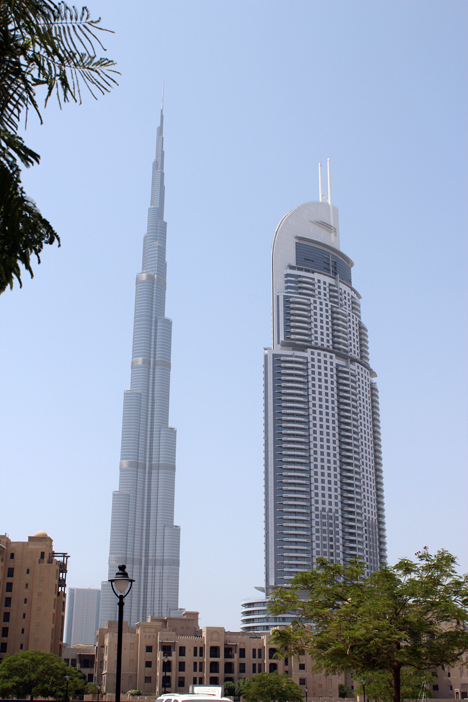 I visited Dubai,UAE during Eid Holidays for a short break. 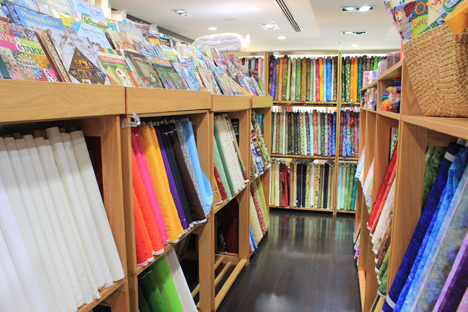 Aside from visiting family and friends, included in my agenda is to visit Dubai’s scrapbook and fabrics shops that I read about online. 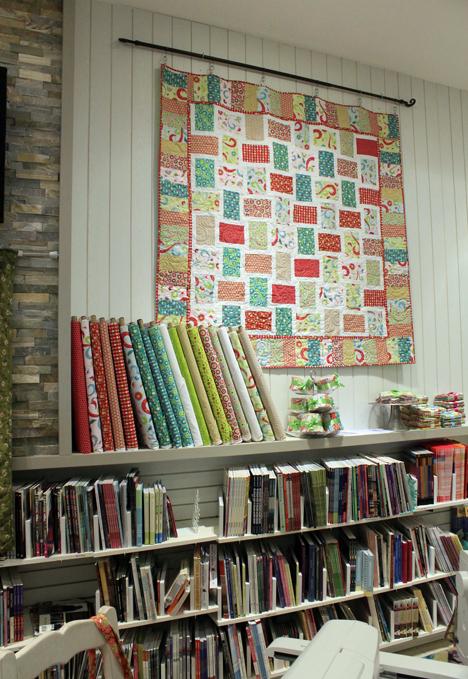 I haven’t got a good photo of the scrapbook shop Paper Lane but I have here some snaps of the two fabric shops Classic Quilt and Craft Land. 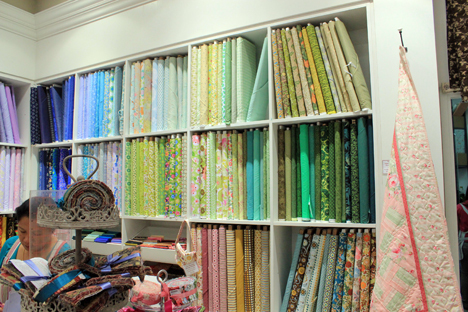 Who would never love those fabrics? 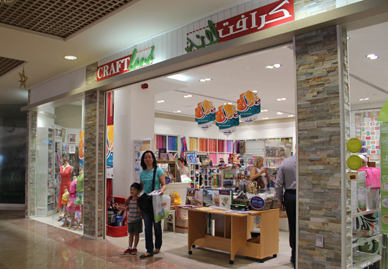 I can even stay at these shops for a whole day just looking at those colors and gadgets. I bought some laminated fabrics for my pouch project, some solids, notions and fusible interface. 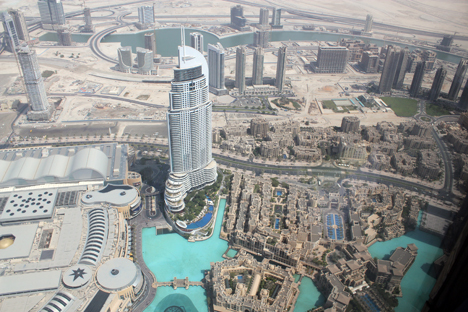 Got the chance to go also to Dubai’s Burj Khalifa, At The Top. 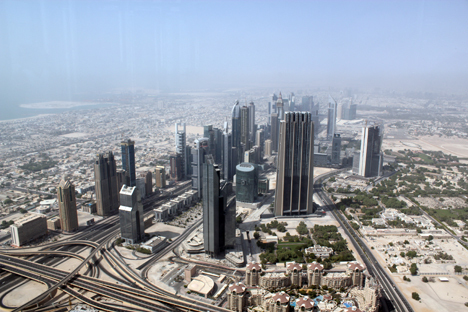 The observation deck is located at the tower’s 124th floor! The tower’s not open to public during my last city visit in late 2009. It’s amazing how people can build such an amazing feat. In opportunities where I have a chance to climb city towers or observation decks, I make it a point to go if I can. There’s always something about seeing the whole city from above. Anyhow, some of the photos here. Back to work after the short break but it’s all worthwhile. I’m currently on a short break and will be posting updates after a few days. I’ll be posting some photos of where I’ve been to. 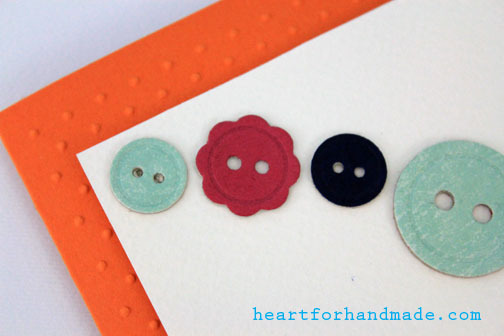 I recently stumbled upon Embellishment magazine blog challenge and decided to play along the latest challenge for the week.The challenge is to use buttons, die-cut, stamp or stitch. 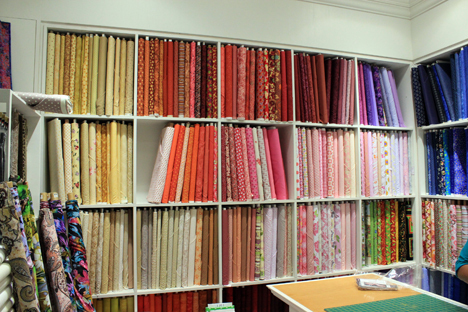 It’s really up to one’s preference but it must have buttons and follows the color pallette of the challenge. My card is very straightforward. I used diecut cardboard buttons and the effect is similar to a chipboard. 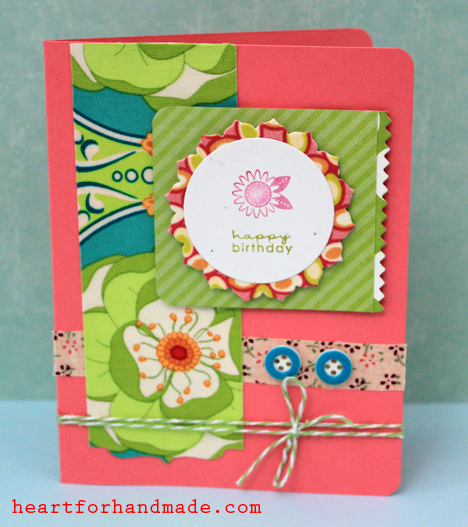 A cardstock and designer paper was used on top of the cardboard giving it color as per the challenge color pallette. 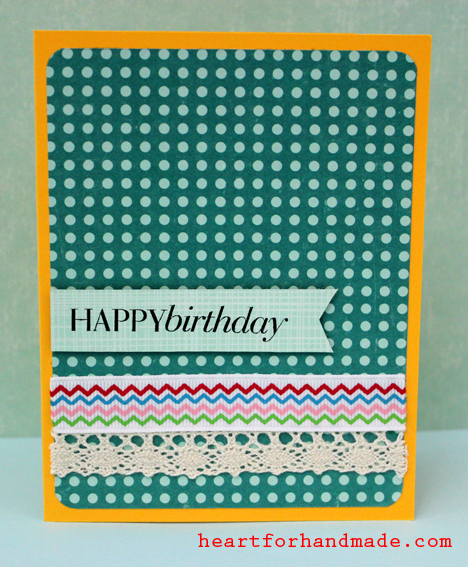 I embossed the main card base with Cuttlebug Swiss dots for added texture. 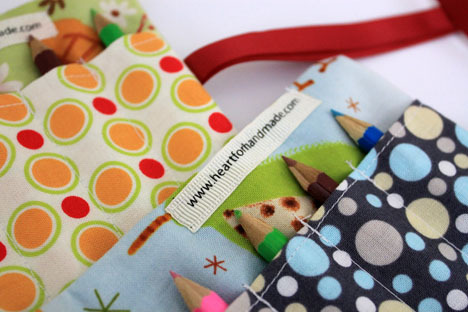 I played along at Zakka sew along, Week 19, sweet sugar cookie sack. There were 25 entries and only one would be chosen as winner. I didn’t win but its fun to be part of the activity such as this. Some of the entries are shown on the photo below. Mine was the one at the bottom right. I posted the project here before. 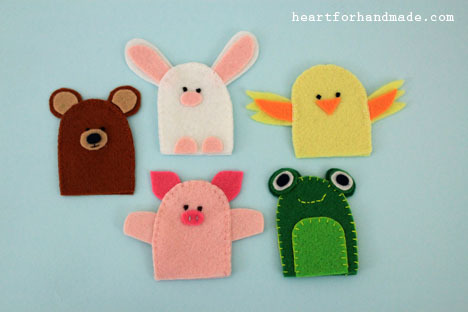 I also did some finger puppets made out of felt. 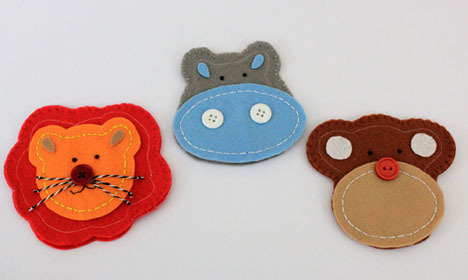 The bigger ones (monkey, lion and hippo) were inspired from Nicole Heady. I did smaller finger puppets too in the past and I’m trying them out again here for the second time. It was all so fun to make. Feels like I’m a small kid again. I posted a sewing project almost 3 weeks ago, would you believe? I mentioned this here. Life has been busy during those time so it really took time to finish the projects. I used the fabrics I cut here. 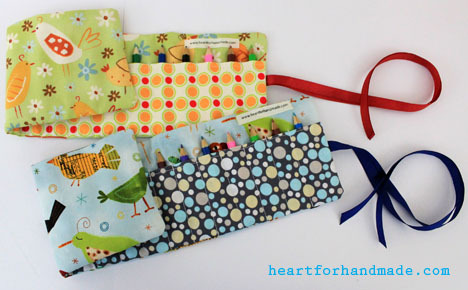 The fabrics are now made to hold 16 piece crayons although my photo shows colored pencils, that can be used too. I haven’t finish the two bigger sized fabrics shown on the cut fabrics but I’ll be posting them here on my blog once it’s done. 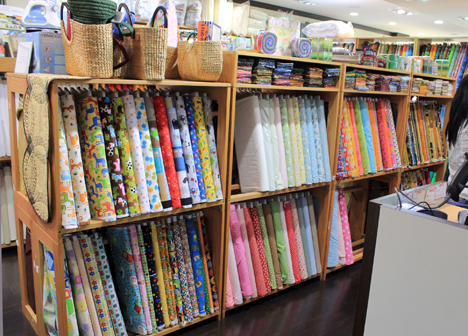 There’s something about fabrics and sewing that I really love. Although I sew only when time permits, I made it a point to do them well. Creating a craft or a project relaxes my system and it makes me happy to see the final product after you worked on them.